New York, NY – June 22, 2015 – Have you had a dog wedding? Was your dog your best man, bridesmaid or ringbearer? If so, enter #TheDogWedding Photo Contest(www.thedogwedding.com/contest) for the chance to see your dog in the adorable romantic comedy “The Dog Wedding”, coming to theaters this Fall! Fifty dog wedding photos will be chosen to appear in the film’s opening credits. Entrants will also win 150 total prizes worth $10,000 from partners including Stella & Chewy’s (a leading brand of premium raw frozen and freeze-dried food for dogs and cats), BarkBox (a box of high quality dog products for your pup, delivered to your door each month), and DogTV (television’s first network for canines). Fantastic doggie care, toy and vacation prizes will be awarded by Petcube, Sniffany & Co. by Dog Diggin Designs, The Saguaro Scottsdale, Dog Is Good, Muttropolis, Grounds & Hounds, The Loving Bowl, Hot Dogs All Dressed, Puppy Kisses online boutique, Bling Bone and The Pet Boutique. Charitable donations will be made on behalf of each entry to Canine Companions for Independence (the largest non-profit provider of assistance dogs) and Chicago English Bulldog Rescue Inc. (the most experienced and longest standing bulldog rescue in the Midwest). The Contest’s partners total 2.1 million Facebook followers, signifying the popularity of dog weddings as a new global trend. From the USA to Japan, pet parents are fitting their pups for tuxes and gowns and throwing wedding celebrations. After all, dogs are family, so why not give them their special day? 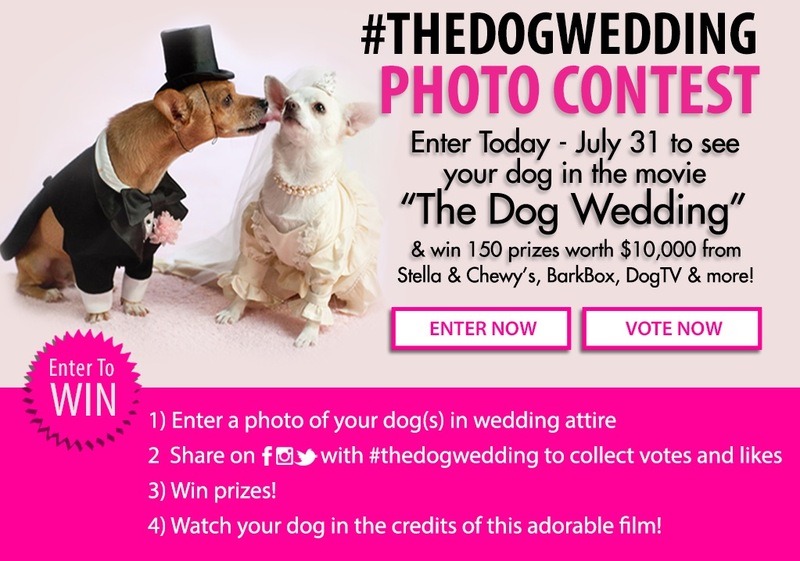 Submit your dog wedding photos today and make your dog part of movie history! About Chicago English Bulldog Rescue Inc.
NO PURCHASE NECESSARY TO ENTER OR WIN. A PURCHASE WILL NOT INCREASE YOUR CHANCES OF WINNING. Please read The Dog Wedding Photo Contest’s Official Rules at www.thedogwedding.com/contest. This entry was posted in News and tagged #TheDogWedding, Barbox, dog photo contest, DogTV, Stella & Chewy's on June 25, 2015 by Rebecca Symon.